You know them. You love them. They are a favorite party food but I'm betting you never enjoyed Deviled Eggs with white truffle and caviar. What better way to celebrate the summer season than with a leisurely lunch in the Seaport District? So, we headed on over to Ocean Prime at the restaurant's invitation to sample the lunch menu. The Seaport is really bustling in the warm weather and alfresco dining choices abound, including outdoor seating here. 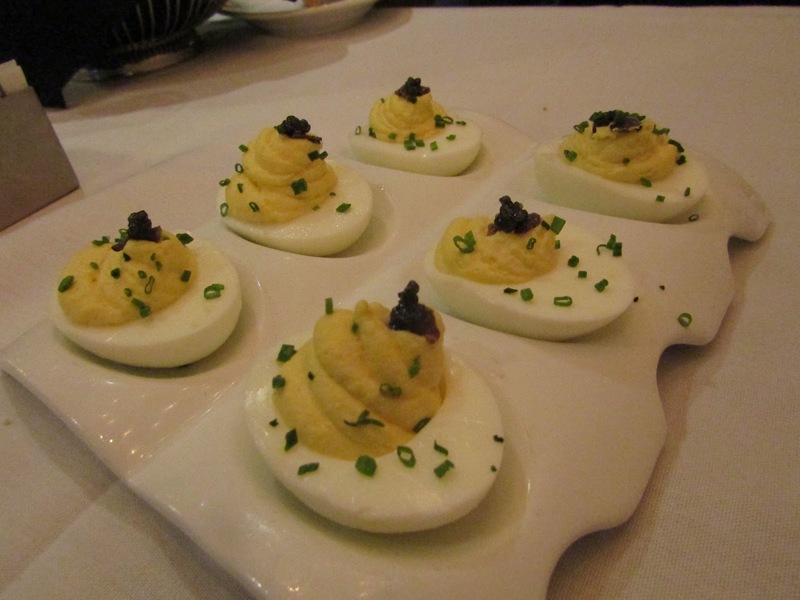 An absolute must for an appetizer are the Deviled Eggs pictured above. It's a signature dish on the menu and the subtle flavor of white truffle and caviar really amp it up. A favorite. As most readers know, I am a huge fan of salmon and regularly enjoy it at least two to three times a week. The Teriyaki Salmon With Shitake Sticky Rice And Soy Butter Sauce was excellent here. 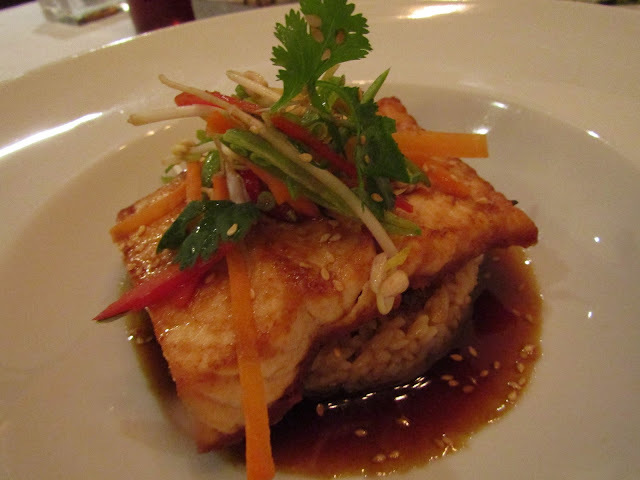 A beautifully crispy caramelization gave way to a very flavorful salmon fillet and the sticky rice was perfectly executed. I highly recommend this dish for any seafood lover. 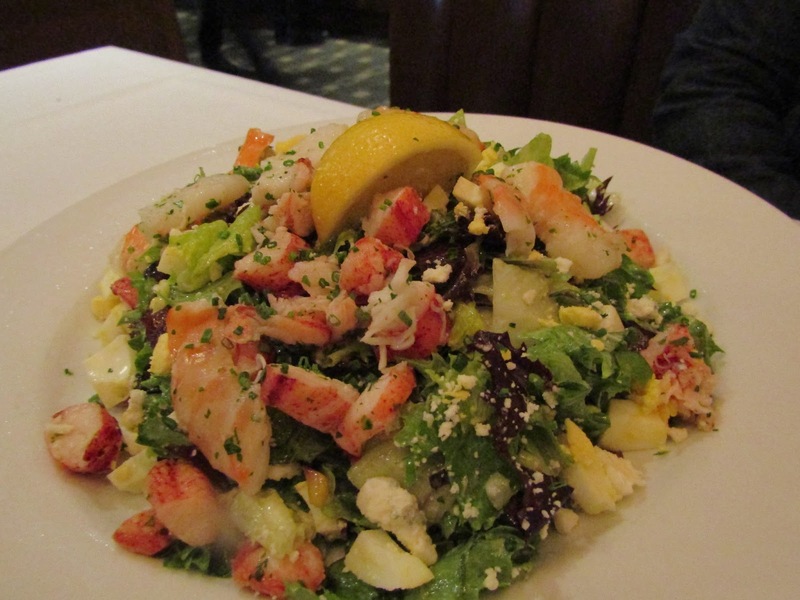 Shellfish Cobb Salad. A bounty of shrimp, lobster, bacon and bleu cheese was drizzled with the house gourmet dressing. 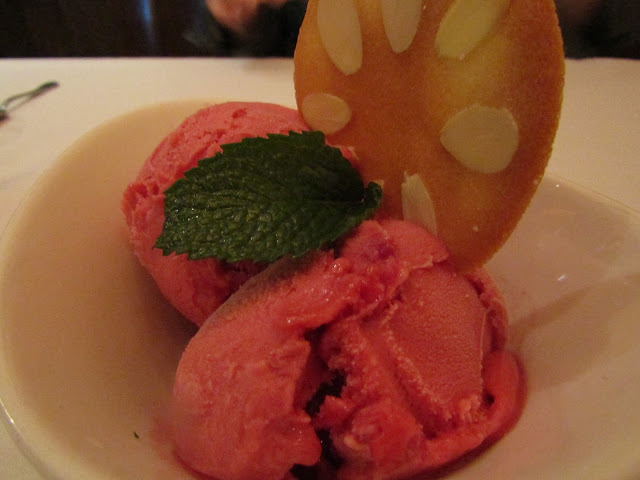 For dessert it was the Raspberry Sorbet. Served with an almond cookie, it finished us off with a sweet treat. What, no drinks? Yes. This day we chose not to imbibe. All the more reason to head back soon to discover what looks like an extensive cocktail menu! As one can imagine the restaurant is large and comfortable and on this day seemed to be pretty much populated with corporate types power lunching and friends or families enjoying a special afternoon out. I am sure that the cocktail and dinner hour continue with a buzz as the offices empty out. So, reservations are recommended.